Little can be said with certainty about the nuclear bomb North Korea says it tested, other than one thing: the technology used was almost certainly not "100% indigenous" despite the government's assertion. "That really would be a first," said Wyn Bowen, director of international security research at King's College London. "No nuclear weapons programme in history has ever been totally indigenous, even the Manhattan project. "You may become self-sufficient eventually but there has to be some access to information and technology," he said. It is known that North Korea's basic nuclear technology came via the USSR, which helped set up a programme for its Cold War ally as far back as the 1950s. 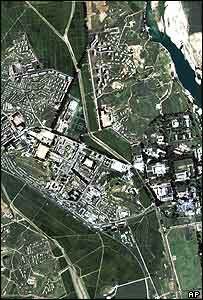 The Soviets built a nuclear complex with a research reactor at Yongbyon in the 1960s and North Korean scientists studied in the USSR. In 1979, the North began an indigenous nuclear programme, building three new reactors and other plants in Yongbyon, according to the International Atomic Energy Agency (IAEA), the United Nations' nuclear watchdog. It signed up to the international nuclear Non-proliferation Treaty (NPT) in 1985 but did not agree to IAEA inspections until 1992. When inspectors found evidence suggesting undeclared plutonium - a key bomb ingredient - they were not allowed to pursue their investigations at suspected nuclear waste sites. A crisis began which was temporarily resolved in 1994 when the North promised to suspend its nuclear activities in return for two light-water reactors, which are deemed to be less of a proliferation risk. The crisis resumed in 2002 after the US reported that the North had admitted in talks that it had a second nuclear programme, this time using enriched uranium. IAEA inspectors were ejected that December and the North pulled out of the NPT within weeks. As a result the IAEA was never able to get a complete picture of the North's programme and was never in a position to state with certainty that its character was peaceful. Even after North Korea's claimed test, the IAEA is still largely in the dark about such issues such as whether it was a plutonium or uranium device. "We have no way of checking their nuclear programme," said IAEA press officer Ayhan Evrensel. "The agency's work is based 100% on analysis of physical samples and going and seeing and detecting and measuring and since we are not allowed to go to North Korea we cannot say what North Korea has or might have." Despite this lack of information, most analysts believe the device was likely to have used plutonium. North Korea is thought to have enough of the material to make a handful of bombs. Experts also believe the North's alleged uranium programme is not far enough advanced to have developed a weapon. Whatever the ingredient, North Korea had to have the explosive technology too, and here the trail is much less clear. The North Koreans have shared military technology with Pakistan in the past but Islamabad has strongly denied involvement in the test. Its foreign ministry pointed out that technology reportedly delivered to the North by disgraced Pakistani nuclear programme founder AQ Khan was "mainly" uranium-based, and is believed to have involved centrifuges. As for China - the closest the North has had to an ally since the collapse of the USSR in 1991 - it condemned the reported test as "brazen". Unless the North's scientists really produced the high-precision detonator technology themselves, its origin looks for now to be buried as deep as the bomb itself.